Why is Uber in Rome more expensive than a regular taxi? This question was based on wrong assumption. From experience I now know that Uber is cheaper then a regular taxi. Rome2Rio is predicting the wrong prices. Can't delete this question, because it got answers, hence this disclaimer. I have been using Uber on two occasions where I became quite a fan. Not only because of the ease of usage, but also because of the very interesting fees (cheap). 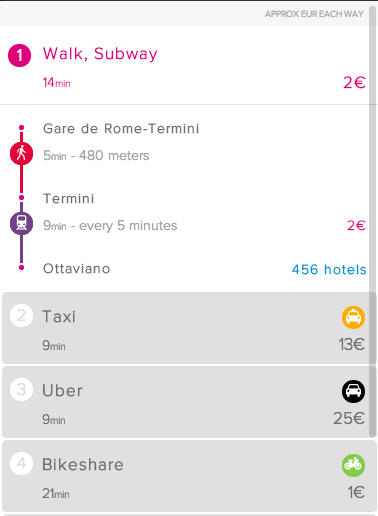 When I arrived in Rome I noticed that Rome2Rio now includes Uber in their proposed routes. However, Uber seems to be more expensive then a regular taxi. Why is that? Generally Uber taxis provide a very highly priced car like Mercedes, etc. for a cab travel. In places where the demand is high, they are able to provide at a moderate price and manage their cost. But in place where the demand and usage is less, they need to cover their costs by charging a little higher price than other cab providers. I guess that is totally okay when you compare it with the awesome experience they provide to the people on board! Edit: Please check out the Uber Rome homepage. They do not run the low end taxis and UberX here. Hence the price!! Based on the distance and on the rates posted on uber.com, the price would seem closer to EUR 11. Uber surge pricing can make it go higher and congestions/waiting time can also impact the price (both for Uber and for regular taxis) but the rome2rio estimate seems off. In Rome, are some days less busy than others? Are there Long-Distance taxis in Malaysia for more than 4 passengers? Are there any good Uber-like taxi apps in Bulgaria? Uber or taxi from Porto Alegre airport? Uber-style rideshare/taxi services in Russia? Uber-style rideshare/taxi services in Mongolia?